There are many different ways to create a website, ranging from desktop applications to pure HTML programming. WordPress is one popular method of creating web pages that are easy to use, while being easy to edit and create as well. WordPress software allows you to make changes and updates to your website from any Internet browser, which allows for the ultimate in ease and accessibility. As soon as you make a change in the WordPress interface, your website immediately updates to reflect that change as soon as you refresh the page. This is the screen you will see when you first log in to WordPress. It is useful in that it summarizes the number of pages, posts, comments, categories, and tags that your site currently has, as well as how much storage space you have used. For now, don’t worry about any of the boxes besides the one labeled “Right Now” in the upper left. 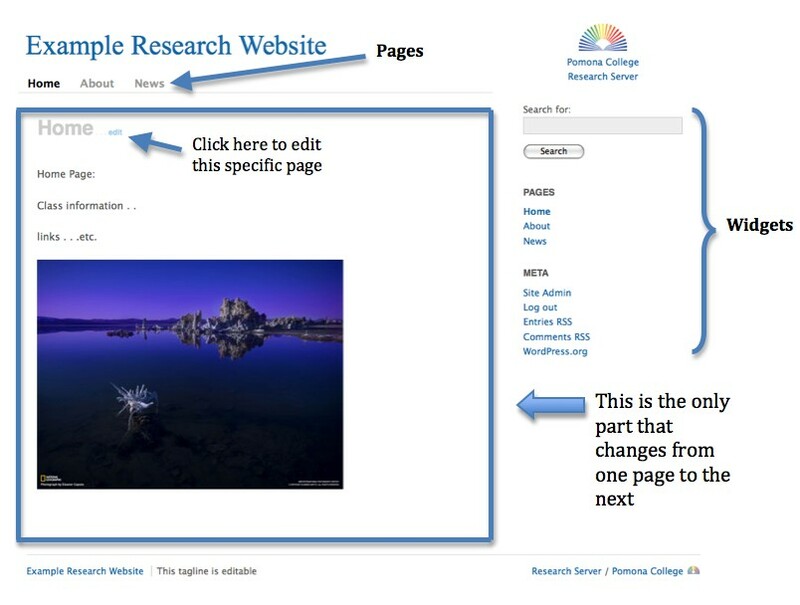 Pages are used to store persistent information; for example, you could make a page for each class that you teach, including such information as meeting times and syllabi. By default, you are given a “Home” page, an “About” page, and a “News” page, but you can delete those or make as many more pages as you want. A post can be a piece of news, a blog entry, or any time-sensitive announcement you wish to make. By default, new posts will appear on your “News” page. New posts will cycle through the News page, which is initially set to show the five most recent posts. For example, you could make a post about a recent field trip your class took, and include text photos, and even video (more on that later). Comments, when enabled, allow any user viewing your webpage to leave a response to your posts. By default, comments are automatically approved for any user that has already had a comment approved on any WordPress site. However, if a new user leaves their first comment on your webpage, you will see on the Dashboard that you have a comment pending approval. By clicking on “Pending”, you can read the comment and either approve or reject it. For every post you make, you can choose a category for it, as well as assign certain tags. By default, each post is in the “Uncategorized” category, but you can create as many categories as you like to suit your needs. Tags are similar in that they can be applied to any post, but you can assign multiple tags to each post, to help identify the contents of the post to users and search engines alike. For instance in a post about a field trip to London with your MATH 101 class, you could categorize the post in the “MATH 101” category, and add tags such as “London”, “Travel”, and “Fun Stuff”. No matter what page you are on in the WordPress interface, you can always click on the “Visit Site” button at the top of the page to see your current homepage. Before making any changes, we will look at the default site you are given to see how the layout works, so click on Visit Site now. The home page you see will be similar to the above example. You will notice that Pomona College’s logo is already in the upper right-hand corner, and there is a very basic layout already in place. This is because by default you are using Pomona College’s Research Server theme. Themes are templates are used to control the parts of your webpage that will be persistent throughout every page on your website. There are many different themes you can use, all downloadable from the WordPress site. Each theme will have a different layout, in terms of columns, placement of page elements, and so on. Notice that for this theme, the “editable” area is the part of the page indicated with the box. That box will show different things whether it is a class page, or a listing of recent posts, but pretty much everything outside of that box will remain fixed. Themes are useful in this way because they allow the user to easily navigate through the site regardless of which page he or she is on. 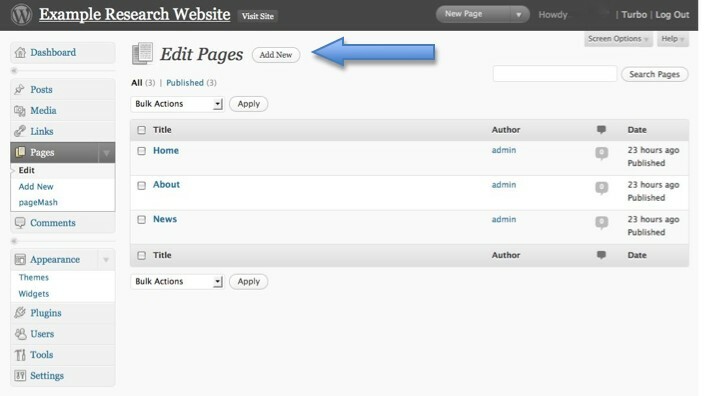 One of the most attractive parts of working with WordPress is the Widgets tool. 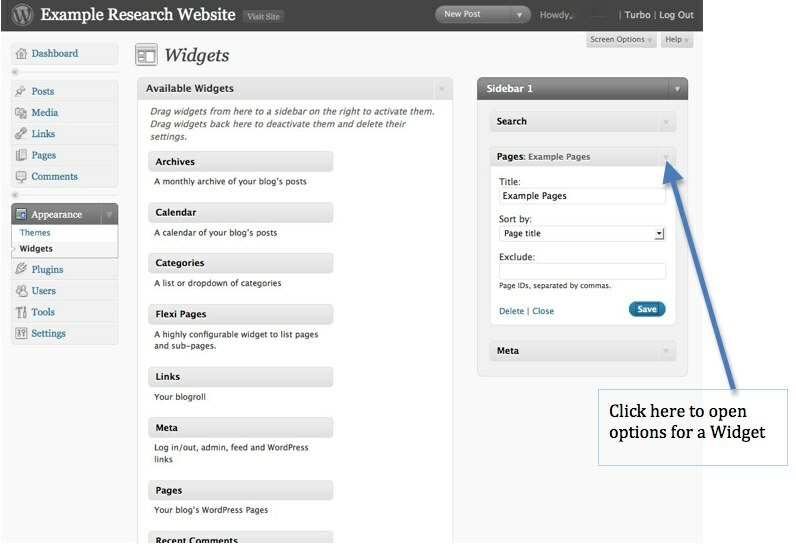 Widgets are customizable features that you can add or remove to your website in order to improve the user experience. 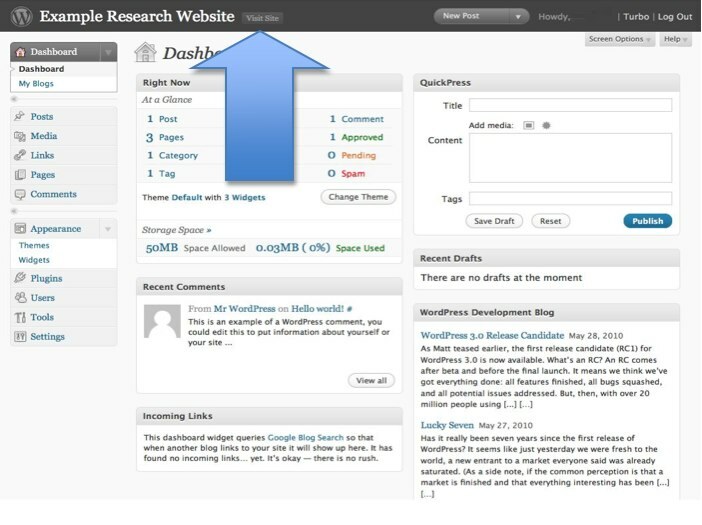 For instance, on the above page there is a Search Widget, which searches all the pages in the website; a Pages Widget, which has the function of listing all the pages in your website; and a Meta Widget, which provides useful links for the user and administrator of the website (you). To access the Widgets tool, click on “Appearance” on the left hand side of the screen, and then click on “Widgets” under the same menu. Your Widgets page will look similar to this one: on the left side are the widgets available to put into the Widget sidebar, and on the right are the widgets currently shown on your webpage (note: some templates have multiple sidebars for widgets). To add or remove widgets, simply drag and drop. To edit the options for a widget, click on the arrow next to the widget name as shown above. Some good widgets to have for your website might be the Calendar, Links, or Archives widgets. You can access more widgets from the Plugins page in the left sidebar (advanced). Now we will see how to actually create new pages and posts. Let’s say you are teaching a class this semester about the history and culture of alimentation, called “Edible Histories”. Let’s start out by creating a class information page. Click on the “Pages” button on the left toolbar. This page will list all the pages in your website for easy viewing and editing. 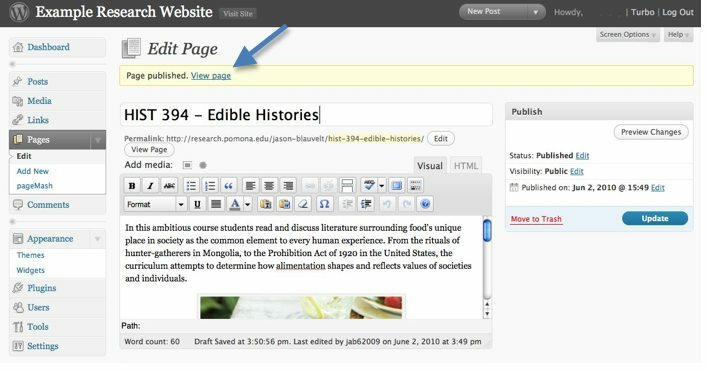 To edit a page, place your cursor over the page name, and click “Edit”. But since we want to create a new page, go ahead and click “Add New” near the top of the page. You can choose to edit your page in “Visual Mode”, which is essentially WYSIWYG. If you feel that you want to try your hand at HTML, you can use “HTML Mode” at any time by clicking the tab above the main edit box. To preview the page you are working on without making any changes to the online version, click “Preview”. When you are ready to submit the page to the web, click “Publish”. Now that we have typed a brief description of the class, we want to add an image to make the page more colorful. Click on the picture frame icon next to “Add media”. 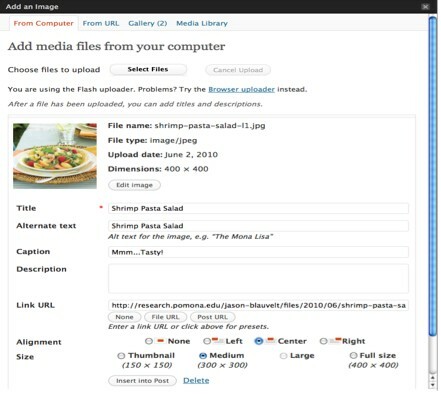 Follow the instructions to upload an image from your computer’s hard drive, a website, or your WordPress Media Library. The uploading of videos and other media is a similar process, but be careful if you are uploading a large number of pictures and videos: storage space is limited! Now that we have some text and a picture to make our class page look nice, click “Publish”. 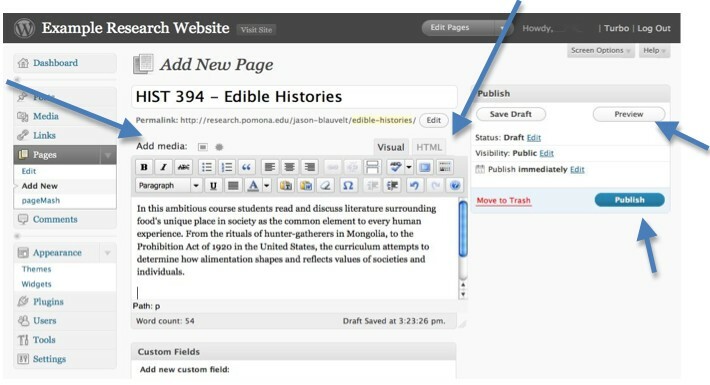 From here we can continue to edit our Edible Histories page, or we can click “View page” to admire our results. Notice you can edit the page by clicking on the “edit” link if you are already logged into the WordPress client; depending on the template, there will usually be an “edit” button somewhere near the title or at the bottom of the page. 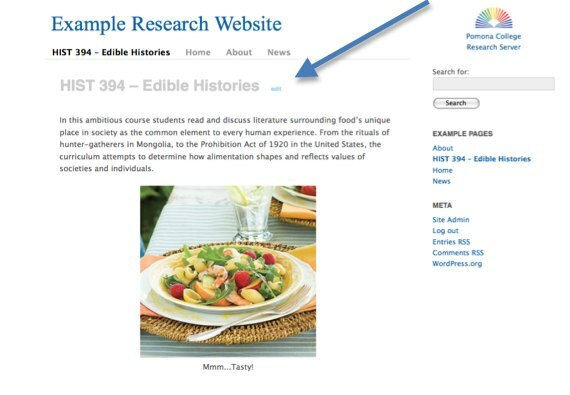 In most templates, such as this one, all pages appear at the top bar, including our newly created Edible Histories page. Now that we have our class page setup, we might want to send out an update to our news feed disclosing a change in the class schedule. To create a new post that will show up in the news feed, click on “Posts” on the left sidebar, and then “Add New”. Creating and editing posts is almost exactly the same process as we used with pages, so there is no need to go over it again. The difference between posts and pages are mostly in their function on the web page: posts are usually time-sensitive news items or any type of blog entry, whereas pages are more suited to long-term data such as class information. The best way to gain proficiency with WordPress is to spend some time playing with the different options and features. Don’t worry if you mess up a webpage, you can always revert back to an earlier version. 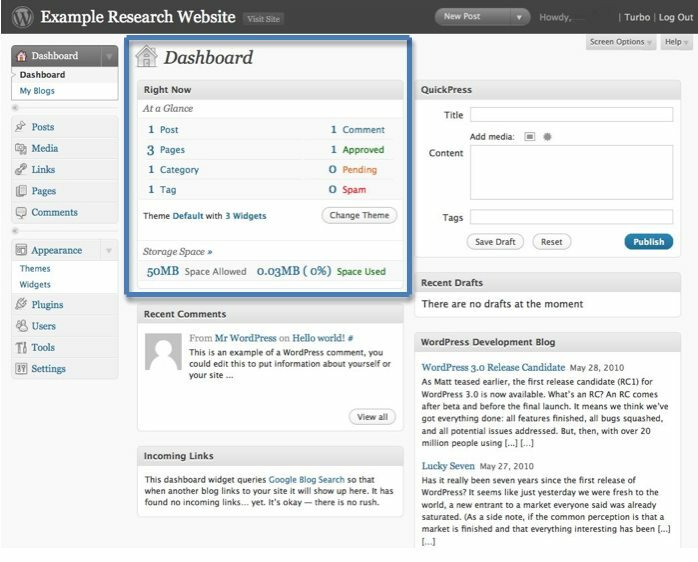 Make some practice pages, try out a few different templates, and you will soon be comfortable with WordPress and make a stellar research website.